Urban Fauna Studio sells independently made and eco-friendly craft supplies and tools. We focus on ecologically and socially considerate manufacturing practices (e.g. no-petrochemicals used, sustainable raw fibers and woods, biodegradable products, and recycled materials) and handmade items. At our studio you can explore the fiber arts (knitting, spinning, felting and weaving), sewing, paper crafts and more! We offer a revolving series of arts and crafts workshops for small groups. Just because many shops are independently owned and selling green products does not make their business practice green. We decided that a more genuine commitment to sustainability was to get certified by the SF Green Business program. SF Green Business helps San Francisco businesses adopt environmental practices that are sustainable as well as profitable. 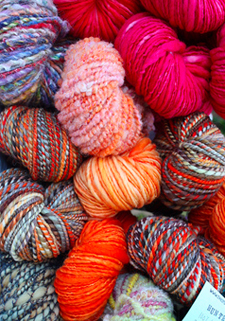 Urban Fauna Studio is the first fiber art and craft shop in the SF Bay Area with a green certification. Our colleague Lauren of Sweet Meats published an interview about our process. If you want to find out more about SF Green Businesses and what we have committed to do, read her article here. Hi! We’re Jamie Chan and Blas Herrera. We’re a husband and wife team who have a passion for seeking creativity in people and enjoy sharing our love of handcrafts. With a combined experience of 15 years in retail sales and 10+ years in education, we want to create an intimate space where people can be free to explore their own creativity. © 2008-2019 Urban Fauna Studio. Design by Purr.